When you moved into your suburban family home 18 years ago you and John certainly weren’t financially set up to live in the lap of luxury (not that you are now either!). 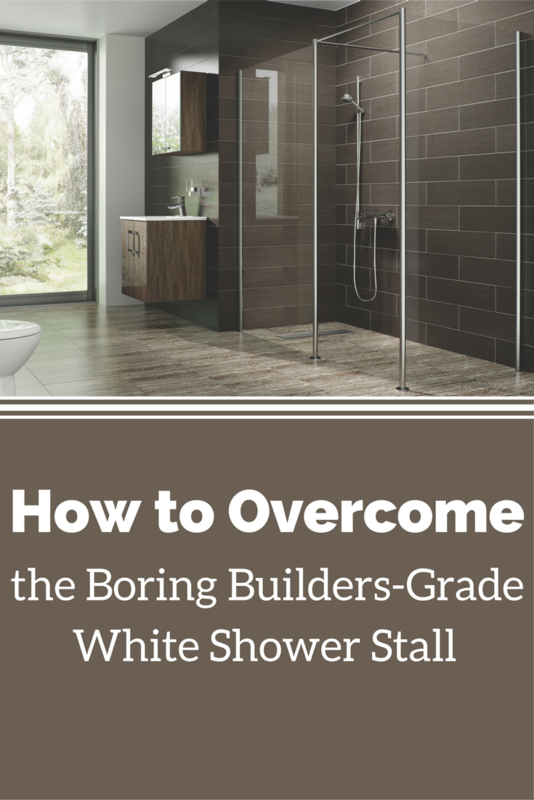 The boring, white shower stall in your first-floor master bathroom was already getting dull. It had some dirt and stain marks on the shower floor. The ugly thin-glass framed sliding glass door wasn’t quite falling off the hinges, but it wasn’t a thing of beauty either. You never knew cleaning the bottom track of this door would get you spewing out so many 4-letter-words a sailor would blush. The plastic shower tree you hung off the shower head isn’t a thing of beauty – but what they heck – it’s getting the job done (even though the soap and shampoo oozes out the bottom). You don’t complain. You have had more than your share of costs to deal with raising Chris and Emily (you never imagined how expensive raising them would be). Now with the kids “almost” off the payroll (Emily already has her first “real” job as an Account Executive with a tech company and Chris is rounding into year 4 (lucky you – sarcasm intended) of his “5 year” college plan. The end of funding the kids is ALMOST in sight. Now it’s time for you and John to finally enjoy more vacations and ditch the ugly master bathroom shower you’ve been putting up with for 18 years. But how can you get a shower which is fun, stylish, comfortable and low maintenance without draining your wallet and sucking up all your vacation funds? In this article I’ll look at 7 smart ideas you can use to blow up your boring, white dirty-looking builders grade shower without using up all your mad money. 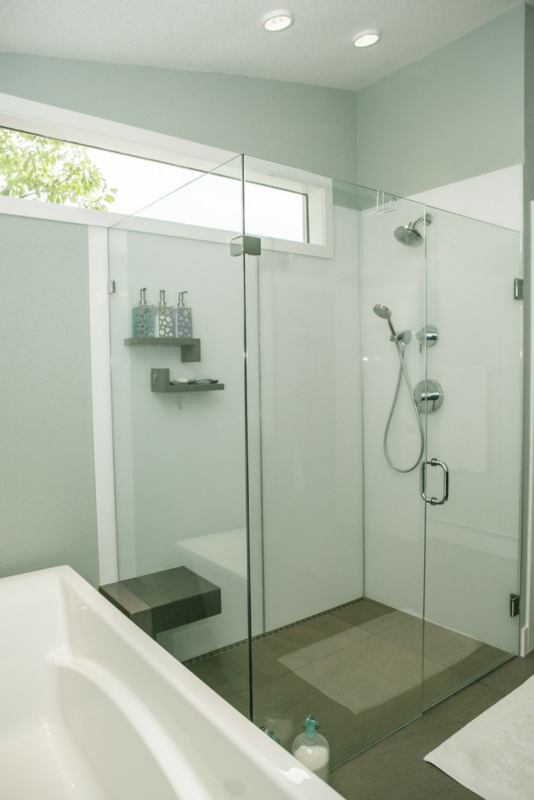 We’ll take a “bottom up” (starting with the shower floor pan, then the wall surrounds and finally the enclosure) look at how you can transform your shower. 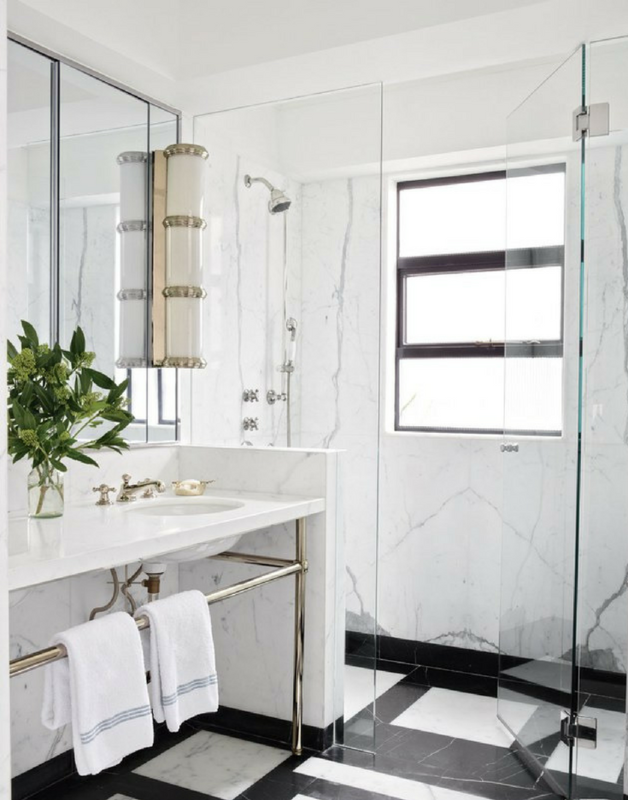 The white, fiberglass, dirt-stained, shower pan you have today is – by far – the ugliest floor in your home (it’s certainly a good thing guests aren’t checking it out when they come visit!). What’s cool is you no longer have to put up with uninspired –impossible to clean shower any more. New lines of solid surface shower pans come in 51 different colors, styles and multiple shapes. You can even select a low-profile curb height (which is 1 ½” high) which is simple to step over if Mom (whose health isn’t the best) needs to live with you down the road. You and John have worked hard. You thoroughly enjoy the occasional trip to the spa with the girls – when you can squeeze it in. However, wouldn’t it be nice on a cold Fall or Winter day to enjoy a more comfortable and relaxing shower floor? 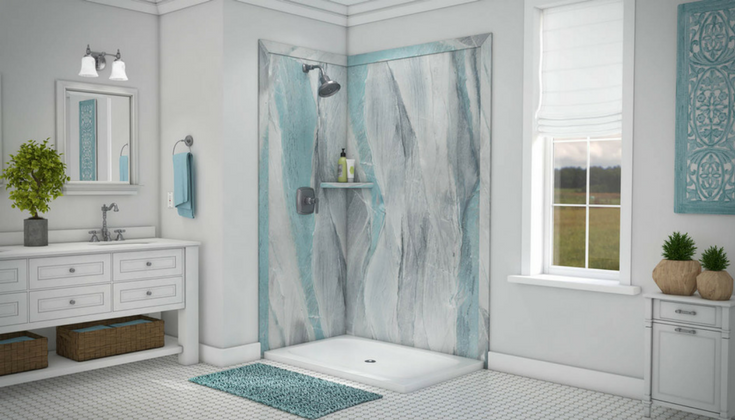 Would you be excited to step onto a warm shower floor vs. absorbing the shock treatment of a cold tile floor on a Winter day? One way to make this happen is to use an in-floor heating system. You can use these in the shower – or throughout a hard tile or stone bathroom surface. It will take the shock and sting out of living through the cold, dark winter days. Contemporary minimalist showers are not only the rage from a design perspective – they are also gloriously simple to clean. When you combine large format floor tiles (with small 1/16” to 1/8” grout joints) with a one level shower floor it creates the best of both worlds – design simplicity and low maintenance. One level wet room shower floor pans and large format tiles allow you to get rid of shower curbs (which are a pain to step over) and can give you an Architectural Digest look without mortgaging your bank account. Boring white thin (or dirty white now) shower surround panels are the pits. Contractors and designers will try to convince you to go with an “up-graded” tile shower, but you know this option will have its own challenges with constant maintenance down the road (note: the interior designer and contractor won’t be pitching in to help you scrub the grout joints either!). Is there a better option for a stylish flair without any day to day maintenance effort from you? One option would be higher-end grout free shower wall panels. If you love a sleek, sophisticated contemporary look high gloss shower wall panels can be the ticket. Choose from clean whites or calming sea-glass colors for a light-filled space other will be oohing and aahing when they see. If you love color – give your shower some pop with vibrant fire-engine red or powder blue panels which offer the light-reflecting qualities of glass. For a more traditional or transitional look PVC faux stone wall panels are a good choice. If you want to DIY the job – they are super-easy to install. A decorative shampoo niche – Wall niches can be more than space-effective way to store soap, shampoo and/or towels. 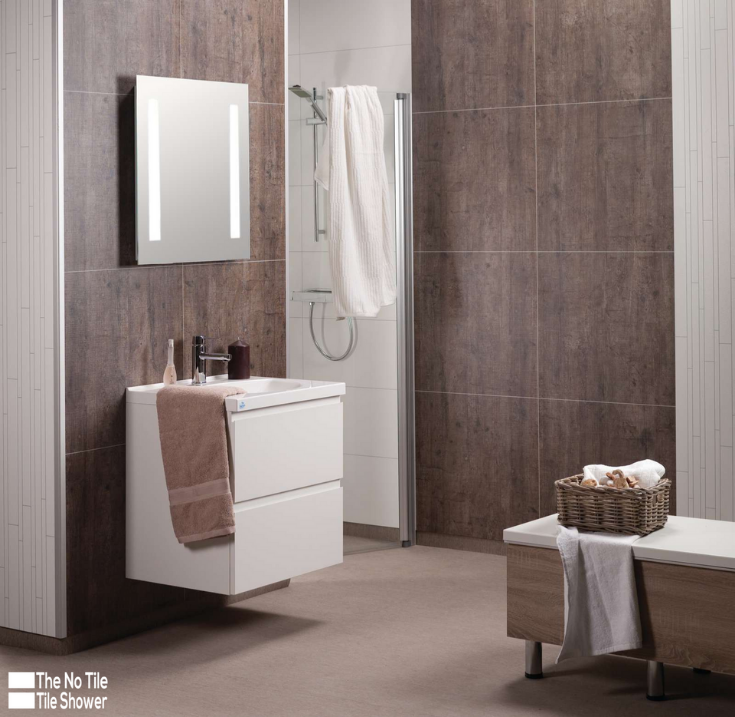 Add a fun tile pattern inside – maybe one which matches with the bathroom tile floor. This will create visual continuity through the bathroom remodel – and it looks oh, so cool. Verticality can equal originality- If you want to add some interest to a small shower adding the feeling of volume can do wonders. Make the space visually soar by putting in a vertically oriented tile border to move the eye up. 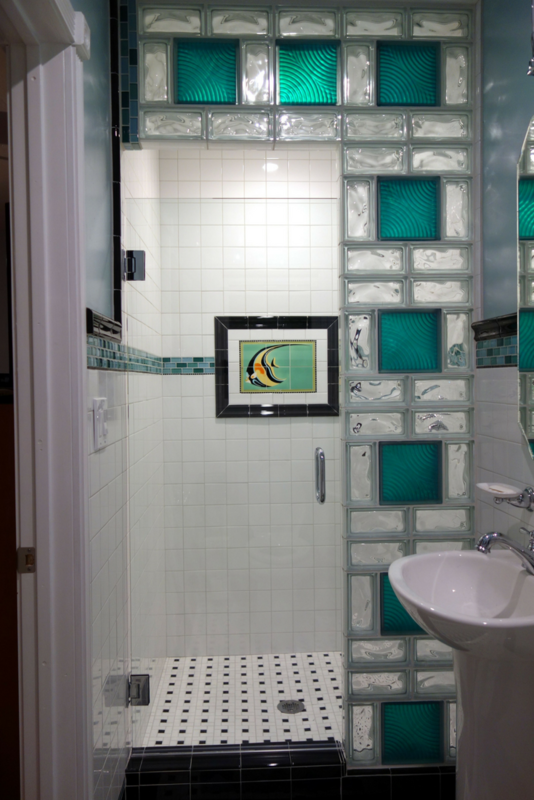 Add a vintage mural with meaning – This entire shower and small San Diego bathroom was built around this historic Catalina tile mural. What a fun way to create a theme for the bathroom and a distinctive shower element. Anybody can put in a clear glass wall – but one with pops of color – now that’s truly unique. With 102 color combinations you can get a straight or curved glass block shower design which will capture your unique sense of style and design. You don’t have to live in a Midwestern beige or monochromatic white boring tile or wall panel world any more. 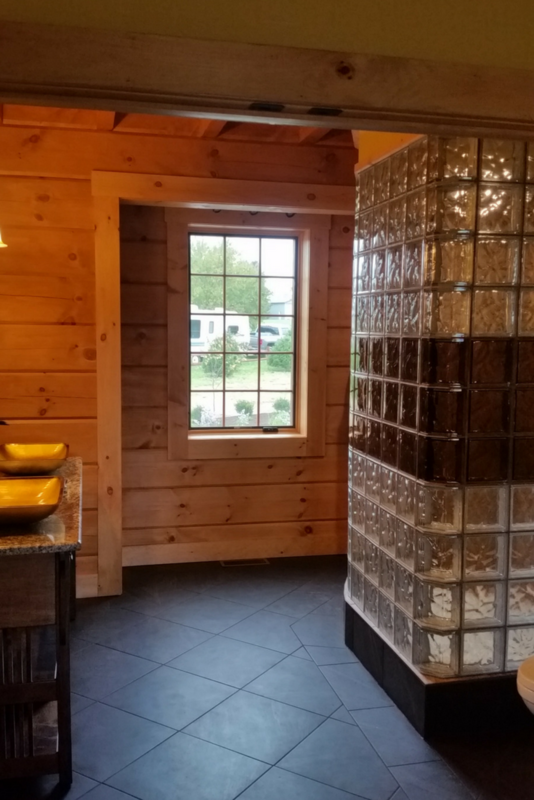 Check out this bronze glass block shower horizontal accent row in a traditional log home – very unique. Is there anything more disgusting than cleaning out dirt and errant hairs from a framed glass shower door (well – maybe cleaning the toilet bowl would be up there as well). Why continue to do this job? Ditch the framed door and the scum in the bottom track which goes with it. 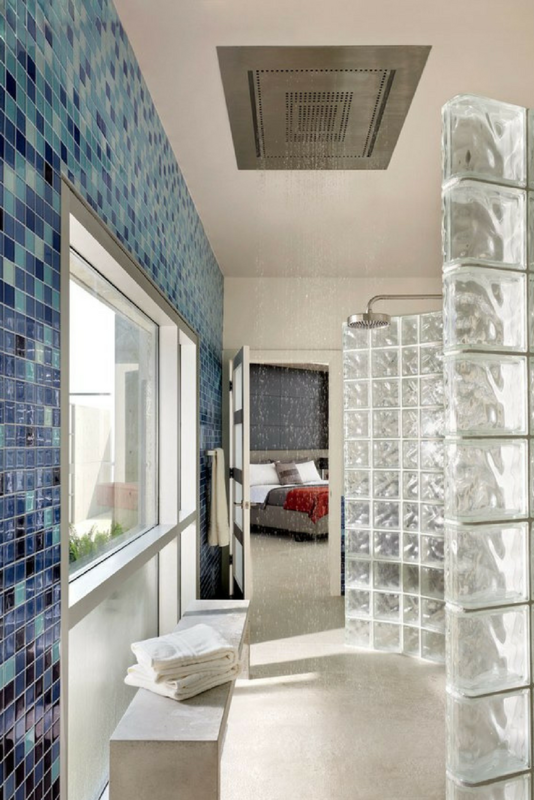 Doorless designs are hot and can even be designed in tiny showers using curved and pivoting glass systems. Ditching the door may even save you money. Now that’s a bonus. If your bathroom is sorely in need of a makeover see which of these 7 ideas would add fun, flair and function to your shower. Don’t shy away from enjoying your home now. When you take a thoughtful (yet fun) approach to a shower remodel you will be able to not only enjoy your bathroom -but also not spending every dime on it so you can take some vacations as well! If you need assistance with a shower remodeling project me and my team will be glad to help. Give us a call for nationwide advice and shower product supply at 877-668-5888. 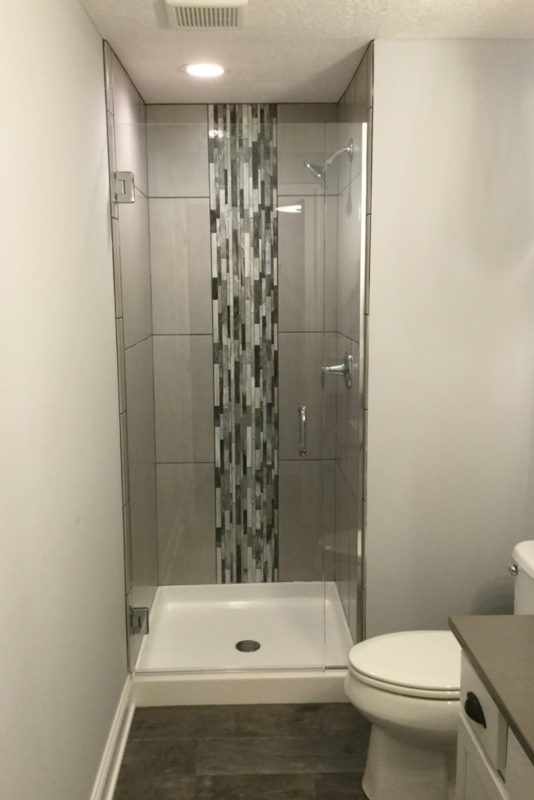 For a Cleveland bathroom remodeling project contact Cleveland Design and Remodeling at 216-658-1270 or The Bath Doctor in Columbus at 614-252-3242.